There will be a total of R10 000 in Prizes across all categories. We are expecting 300+ competitors for the Mountain Bike Race and Trail Run. Competitors are encouraged to check in a day prior to the event. There will be Camping Facilities and various different accommodation options. Due to the success of 2017, we’re doing the Tent City bigger and better for 2018. There are 30 tents available, at a cost of R935.00 for the whole weekend. This includes accommodation for 2 for the whole weekend as well as Friday meal tickets and the REFENTSE live show. 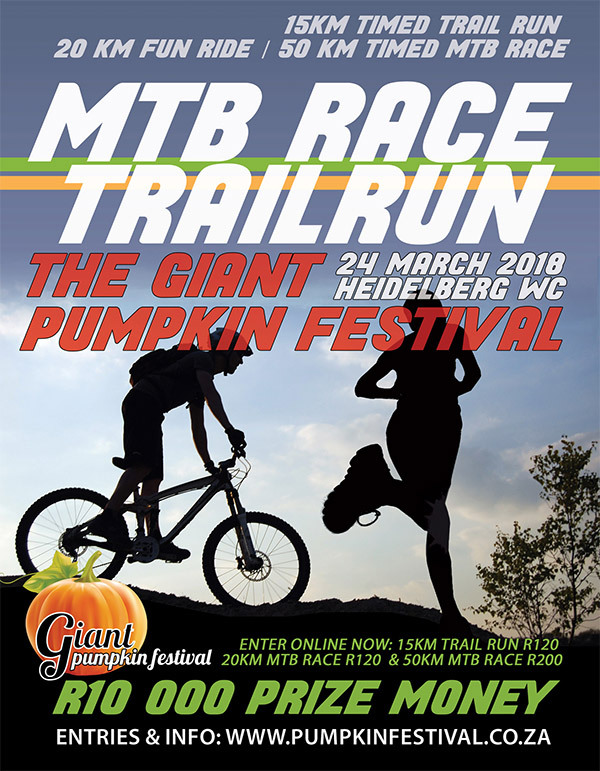 The Giant Pumpkin Festival takes place at the Heidelberg Showgrounds in Heidelberg WC. Heidelberg is 275km from Cape Town.